Essex Rotary can now offer this high quality catalytic converter as an affordable alternative to replacement of your failed OEM Mazda cat. This catalytic converter complies with the latest Catalyst regulations that came into force on the 13th August 2009. This Catalytic Converter meets R103 type approval conforming to the new EU Emissions regulations now necessary for RX-8's to pass the U/K MOT test. Constructed from superior matrix materials to those offered at a much cheaper price our Cat will give you many years of trouble free operation and will not illuminate the CEL, We have now installed these on many customers cars and have a long track record of trouble free use. Please note if you have not addressed the cause of your Cat failure before installing your new Cat this will cause your new cat to fail prematurely, and in some cases the manufacturer may void the warranty. Please allow up to 7 days for delivery of this part. The Racing Beat RX-8 manifold is constructed using 100% stainless steel for superior quality, performance and appearance. Exclusive cast stainless-steel mounting flange has been designed to allow the smooth transition of the exhaust gas flow from the engine to the primary tubing. Incorporated into the flange design are critical emission control air passages that were included on the OEM flange design. These small passages allow air to be pumped into the exhaust ports to aid in more efficient catalytic converter function. The Racing Beat manifold does not remove any catalytic converters, and is equipped with an oxygen sensor fitting and retains all emissions control functionality. The Racing Beat Manifold utilizes 1.75” OD, 14 gauge (.083"), mandrel-bent, 304 stainless steel tubing and features an exclusive Racing Beat engine-to-header flange. All required mounting hardware, an outlet gasket, and instructions are included. A engine-to-manifold gasket is NOT supplied with the kit, but the stock unit can be re-used unless it shows signs or damage, leakage, or extended wear. The Racing Beat REV8 "Street Legal", Cat-Back RX-8 Exhaust System (Twin Outlet Tips) is the perfect replacement for your stock exhaust - a durable assembly offering a real horsepower gain over your stock unit. 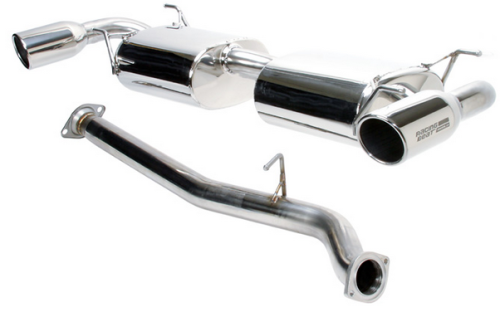 Our RX-8 exhaust system consists of a 304 stainless steel Racing Beat connecting-pipe, muffler canisters, tubing, flanges, and outlet tips. The replacement connecting-pipe is manufactured using 3-inch (OD) tubing and features cast stainless steel flanges for positive exhaust gas sealing. 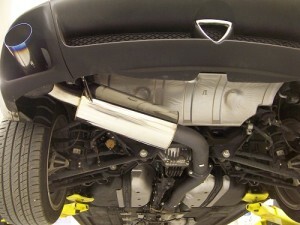 Twin Tips: The REV8 Exhaust system will certainly stand out from the crowd with its distinctive twin tip outlet design! A first of its kind offering for the RX-8, these highly polished stainless steel tips offer a welcome change from the standard single tip design and provide a well-balanced look to the rear of the RX-8. Mirroring the design of the new-for-2009 tail light assembly, the twin tips provide a symmetrical balance from rear facing angles, and maximizes the exhaust openings in the bumper. Available for both 2004-2008 and 2008-2012 RX-8 models. The "Racing Beat REV8” street legal, cat-back exhaust system is the perfect replacement for your stock RX-8 exhaust with many happy customers proving testament to this. The system is designed for the owner wanting a quality system that is not too loud that the noise drones in the cabin, but loud enough to hear the true sound of the Rotary engine when you want to plus you will see horse power and torque gains to make your RX-8 even more fun to drive. 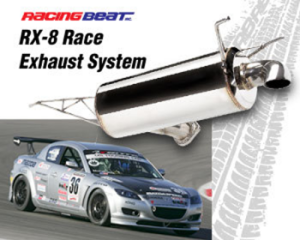 Offering a real horsepower gain over your stock unit, the Racing Beat system consists of a 304 stainless steel Racing Beat connecting-pipe, muffler canister, tubing, flanges, and outlet tips. The replacement connecting-pipe is manufactured using full 3-inch (OD) tubing and features cast stainless steel flanges for positive exhaust gas sealing. The stainless steel muffler canisters are each finished with 4-inch, polished 304 stainless tips for an aggressive look. 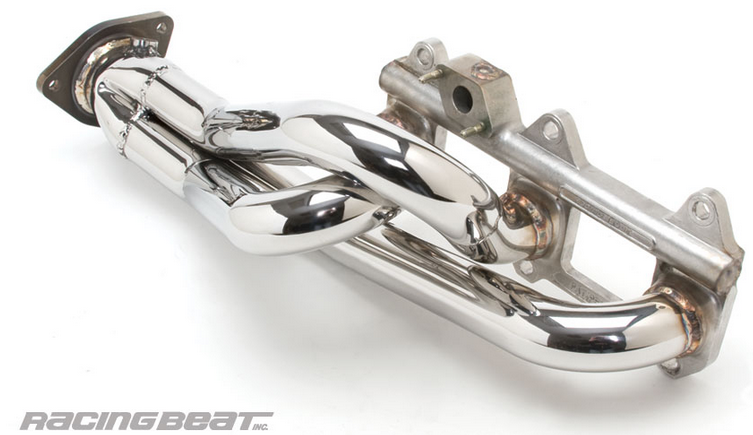 Racing Beat offers a full 304-stainless steel race pipe for RX-8 (for racing applications only). The race pipe is equipped with a sensor fitting for the oxygen sensor. (Note: Placement of the sensor in the pipe will cause the "check engine" light to be illuminated, but performance and engine systems will not be affected.) Removal of the OE catalytic converter/presilencer section will result in a noticeably louder exhaust tone. By now its well known that a non-resonated catalytic converter pipe on the RX-8 can produce a overwhelmingly loud exhaust and cause "drone" in the cabin at motorway speeds, but if you require a modest, quieter exhaust tone, then the Racing Beat dual resonated pipe is your answer. 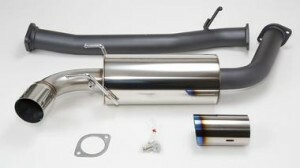 Designed to provide the ultimate combination of performance AND sound, this pipe is sure to be a hit with RX-8 owners. Racing Beat offers a full 304-stainless steel catalytic converter replacement pipe with dual resonators for RX-8 racing applications. Fitted with two (2) specially designed resonator units specifically for the RX-8 chassis. Both our resonated and non-resonated pipe versions are a direct bolt-on replacement for the stock catalytic converter section. Our replacement pipes utilize a genuine OEM rear mounting flange for a secure fit to the stock (or an aftermarket) exhaust system. Each replacement pipe is equipped with a sensor fitting for the oxygen sensor. Important: Whilst this is a perfectly safe modification to normal aspirated RX-8's, If your engine has a Turbocharger or a Supercharger fitted, fitting this de-cat pipe will make the exhaust gasses escape more freely and could increase the boost level causeing the engine to detonate with out the ECU being remapped. 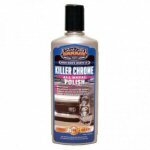 PLEASE NOTE for legal reasons this product is sold for off road use. Genuine HKS Legamax Catback system to fir the series 1 RX-8 2004-2008 Made from polished 304 stainless steel this beautiful system will look great for years to come and sound even better. designed to reduce back pressure bu increasing the exhaust flow its worth noting this system is not on the subtle side of the spectrum. Please note this will not fit the R3 version due to the revised rear bumper design on the R3 These systems can take up to 28 working days for delivery from HKS Japan. This beautiful catback system from the world famous Trust GReddy is made from high quality Stainless Steel and finished with GReddy's slash style burnt tip (coloured) exhaust tips. This system looks and sounds great and will add a sportier look top your RX-8 The GReddy CS-GT catback comes in two versions, please select your model RX-8 in the drop down menu. Catback systems will only replace the rear exhaust muffler and does not replace the catalytic converter so you stay legal. These systems are shipped direct from GReddy Japan so delivery can take up to 28 working days. The Black Halo Racing Midpipe is a 3-inch pipe design with a single resonator (the design of which is exclusive to Black Halo Racing) that proves two resonators are not necessary to quiet down the Renesis and provide a great sound. This pipe does both with unmatched build quality and durability. By utilizing a resonator which has no internal packing it will retain its tone practically forever. Our midpipe also provides OEM fitment and will bolt up to the stock exhaust manifold as well as any cat-back exhaust system that uses stock mounting points. Please allow up to 28 working days for delivery of this part. The Black Halo Racing Midpipe with High Flow Cat is a 3-inch pipe design with a single resonator (the design of which is exclusive to Black Halo Racing) that proves two resonators are not necessary to quiet down the Renesis and provide a great sound. This pipe does both with unmatched build quality and durability. By utilizing a resonator which has no internal packing it will retain its tone practically forever. Our midpipe also provides OEM fitment and will bolt up to the stock exhaust manifold as well as any cat-back exhaust system that uses stock mounting points. A 3" ceramic catalyst is in welded in to this version of the resonated midpipe for those concerned with exhaust emissions. This catalyst is not suitable for track use nor does it come with a warranty. If your factory catalyst has failed please be sure that your ignition system and your engine are in proper operating condition before ordering the optional catalyst installed on your midpipe. Essex Rotary are very excited to bring to the UK the most anticipated exhaust header of all time for the RX-8, The Black Halo Racing Long-Tube Manifold. This header is intended as a "race-only" application as it has no AIR pump fitting, will not fit an exhaust catalyst, will trigger the 410 and 420 CELs, and is not CARB certified. After years of development and testing for performance, fitment, and durability, Black Halo Racing is excited to announce the Black Halo Racing Long-Tube Header that many have waited for is finally available and production has begun. Over a period of two-plus years this header was tested on a few different RX-8s with similar performance in all cases. The attached dyno sheet is from a 6-port/6-speed 2008 RX-8 with about 25K miles on it and using a BHR Ignition System as it's only modification (installed well before the dyno test was performed), including still using the factory cat-back exhaust system. Typical rear-wheel horsepower gains were 20-25 rear-wheel horsepower, with additional engine torque being demonstrated as low as 2,000 RPMs, but actual total gains in power are dependent on the age/condition of each engine and the presence of other modifications. Utilizing three 1-7/8" primary pipes and a 3" merge collector, this header balances easy installation, interference-free fitment, and the most free exhaust flow possible. In addition, the CNC-milled engine flange has very smooth transitions from the rectangle exhaust ports to the round primary tubes. The Black Halo Racing Long-Tube Header includes a 3" midpipe outlets and all the gaskets and hardware needed for a comprehensive swap from your factory manifold A discounted option is available for those who already have a 3" midpipe. 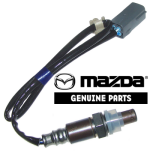 Mounts for the factory front and rear oxygen sensors are also installed and positioned in their OEM locations. Due to the value of this part these headers are special order only and may take 4-6 weeks to be manufactured and shipped to us from BHR in the USA. Please remember you may need to allow up to this amount of time from order placement to arrival. This is the sensor that is installed in the exhaust manifold. Please note that there are 3 different sensors depending on your vehicle. Please select your correct part from the drop down menu. 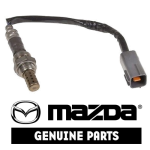 This is a genuine Mazda rear O2 sensor (found installed in your catalytic converter) for your RX-8 in many cases installing a pattern sensor will mean that cat monitoring (whitch is primarily what your rear O2 sensor is for) will not work correctly, we have found in the past that customer who have ionstalled a cheaper pattern or universal rear O2 sensor have had a failed cat however the ECU has failed to detect this. This is the sensor that is installed in the catalytic converter. The design and construction of the Nur Spec Touring exhaust is second to none. They are engineered from SUS304 grade polished stainless steel, with computer controlled precision ‘Tig’ welding. <br /><br /> Nur Spec Touring exhaust systems feature a new inner silencer design to increase power and decrease noise. <br /><br /> All Nur Spec Touring systems have passed the new Jasma regulations in Japan. <br /><br /> Nur Touring systems are generally quieter than other systems, please check individual product info for the decibel rating. All SUS304 stainless steel specification makes the exhaust system high quality. All TIG welded. High quality and durability. High endurance hybrid silencer of patent technology. A new design and an oval tail that produces a feeling of luxury. 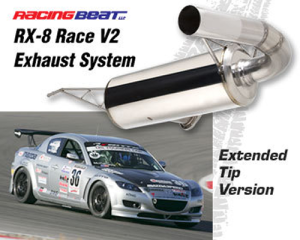 The Racing Beat RX-8 Race Exhaust System V2 with 3" bore and extended tip is a lightweight exhaust system that is intended for race applications. Originally designed to meet the demands of RX-8 autocross/circuit racers, this system is significantly lighter than the stock system and has been designed to meet a race track-imposed sound limit. As compared with our original RX-8 Race exhaust system, the V2 version features an extended tip section which extends rearward through a single bumper opening. We can now offer this sought after single exit catback system for your Series 1 RX-8 from HKS. Inspired and designed from endurance and GT racing in Japan, HKS developed its Hi-Power Exhaust system for turbocharged applications. HKS has incorporated this new race inspired offset muffler and piping design into many street applications, which offers a greater flow and higher-PRM power gains due to the less restrictive design. This is achieved by eliminating unnecessary bends for the straightest exhaust path. Lighter then full twin tip backboxes.